Show Mom just how much she lights up her kids lives with this customizable necklace. We all feel like Mom hung the moon, don't we? Show her just how much she lights up you and your sibs' lives with this personalized bronze and sterling silver necklace. Add up to four stars to surround Mama Moon, and choose a birthstone gem to adorn each one. Because when it comes to a mother's love, sky's the limit. Handmade by Canela Lemoine in California. 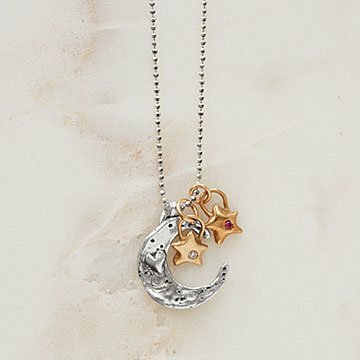 Moon Pendant: .8" Dia, Star: .4" Dia, Chain: 18"
The stones are so small you can barely see them. Not at all like the picture. Went to return and refunds are not allowed. Not much value for the money. I was somewhat embarrassed to give it as a gift. Looks kind@ cheap.